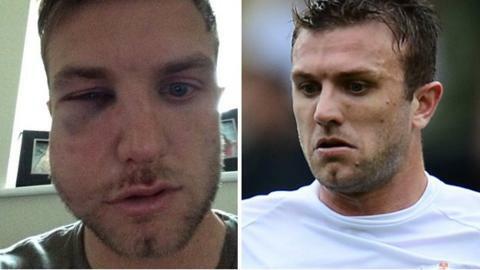 Port Vale captain Doug Loft has opted not to take legal action against Daniel Jones after suffering facial injuries in a training ground row last week. The 27-year-old was ruled out for the remainder of the season after being left with a broken cheekbone. But Loft is happy with the way the matter was dealt with by the League One club, who sacked Jones on Monday following the incident. "I've nothing but praise for the way it was handled," he told BBC Radio Stoke. Former Wolves defender Jones, 27, was dismissed following an internal club investigation instigated by manager Micky Adams. Loft's one-year contract expires at the end of the season, but he could stay at Vale Park. "Micky Adams has been great," added Loft. "And I've been told that I'll make a full recovery. "This came completely out of the blue, In fact, the Vale dressing room is the strongest it's ever been. "I have been playing really well and I was getting a lot of interest. I knew people were watching me. And I'm annoyed and upset that I will miss the rest of the season. "I'll have to wait and see what offers I get, but I wouldn't rule out being a Vale player again come August." Loft said that he had never had a problem with Jones prior to the incident. "We went into a tackle and, as I was getting up off the floor he hit me," said Loft. "I fell backwards and sat on the floor, the gaffer sent him in and I went to hospital for X-rays." Jones sent a text message of apology to Loft, who has confirmed that he will not press charges.